Celebrate the end of winter — and the arrival of fresh spring produce — with this martini made with seasonal Meyer lemons and rosemary. Spring is officially here! Mother Nature must have missed the memo, because we got 3 inches of snow on Friday, the Spring Equinox. DO NOT LIKE. Don’t misunderstand me, I sort of like winter. I love living in an area where we experience four distinct seasons. Though as far as I’m concerned, winter could last one month, and we could add those remaining two months on to spring and fall. Two or three weeks after New Year’s, I’m DONE with winter. Spring means fresh produce, farmers markets, and longer daylight hours. One of my favorite spring produce selections is Meyer lemons. The lemon-orange hybrids aren’t the easiest to find in my East Coast area, as they require a warmer climate to grow. I’ve only ever seen them at Wegman’s (thankfully, at my new apartment, I’m much closer to a Wegman’s location). The slightly sweeter, less acidic flavor really shines in this simple martini. 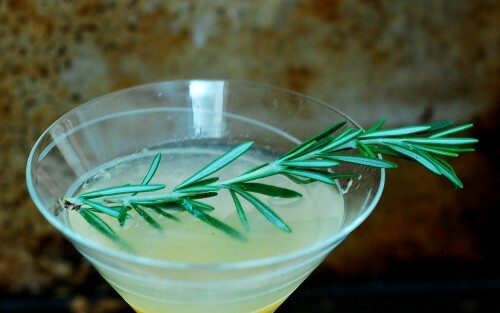 The rosemary adds an earthy, almost savory quality to the martini. Muddle lightly for a subtle hint of rosemary; muddle harder for more a prominent flavor. Then sit outside on a not-so-cold evening and sip as you watch the sun go down. Welcome, Spring! The recipe makes enough simple syrup for four martinis. If you don’t use all of it for martinis, you can also use the syrup to brush on cake, add it to your tea, drizzle over fresh fruit, or use it a poultry or seafood marinade. Place the sugar, water and Meyer lemon peel in a small saucepan. Heat over medium heat, stirring frequently until the sugar dissolves. Increase the heat and bring the mixture to a boil. Reduce the heat back to medium and allow the mixture to simmer for 2 to 3 minutes. Set aside to cool completely. Remove the lemon peel and discard. Store the syrup in an airtight container in the refrigerator. Syrup can be made a day ahead. Place the rosemary sprig and 1 ounce of the simple syrup in the bottom of a cocktail shaker. Muddle with the end of a wooden spoon a few times. Add the vodka, Meyer lemon juice and ice to the cocktail shaker. Shake for about 30 seconds. Strain the mixture into a chilled martini glass. Float a candied lemon slice or a sprig of rosemary on top of the martini and serve. To make candied Meyer lemon slices, cut one Meyer lemon into 1/8th-inch rounds. Discard any seeds. Combine 1 cup of sugar, 1 tbsp of lemon juice, 1 tbsp of orange juice, and 3/4 cup of water in a skillet over medium heat until the sugar dissolves. Add the lemon slices to the skillet, making sure none overlap, and simmer gently for about 15 minutes, turning the slices frequently, until the pulp is slightly translucent and the rinds are soft. Remove the skillet from the heat and use tongs to transfer the lemon slices to a wax-paper-lined baking sheet to cool completely. Slices can be stored in an airtight container in the refrigerator for up to 2 days. Check out all of the #SundaySupper Spring Fling recipes! Cheers to this great martini! So much better than a lemon drop. This sounds so refreshing with a little hint of Rosemary. What a fun spring martini! And your garnishes are perfect!!! I just bought Meyer lemons!! I absolutely love martinis with fresh herbs – rosemary, basil, mint. This sounds perfect! Sounds like a great cocktail for an after work get together. It looks refreshing! I can’t stand winter. I want to move so badly to a state where I never, ever see snow again. For now, I’ll just have to drown my sorrows in one of these martinis! Perfect spring martini, love everything about it. Rosemary is so wonderful in cocktails! The rosemary adds the perfect touch and makes it different from all other lemon cocktails. My rosemary isn’t up yet, but when it is, I’ll be trying this! I was looking for a cocktail to make for ladies night. I’ve just found it. They are going to love this one. 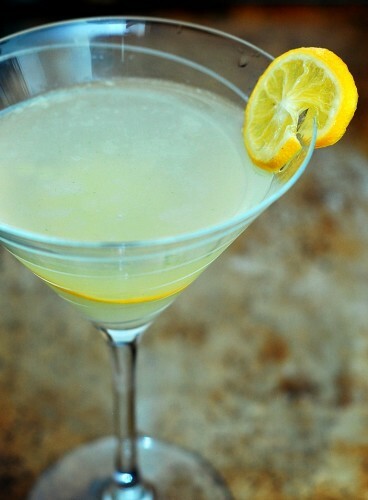 Oh I love a lemon martini! This looks so wonderful with the rosemary added! Now that’s my kinda drink! ‘m not a vodka drinker myself, but my husband would LOVE this! Thanks for sharing. Such a gorgeous cocktail and I love the addition of rosemary! Uuum no to the snow, and YES PLEASE to this yummy martini!! What a lovely recipe! I love meyer lemons… and hope you get to Spring-like weather soon! We must live near each other, cuz I got the East Coast snow on Friday too. Unbelievable!! 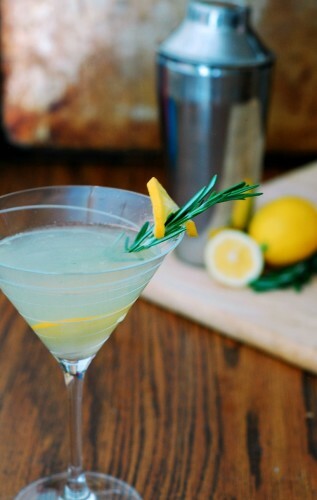 The combination of meyer lemon and rosemary is absolutely perfect. 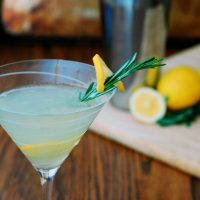 I’ve recently become a big fan of using rosemary in cocktails and you have definitely done the idea proud! So pretty and inviting, Coleen! I love Meyer lemon! what a perfect use for it here. I am sure it is perfect to sit and sip on the front porch! Such a pretty cocktail. Happy Spring! Hi mates, how is the whole thing, and what you want to say concerning this post, in my view its in fact awesome designed for me.